The sun shone through our curtains at the Embassy Suites by Hilton in Old Town Montreal and as it filled our room with energy, we woke, the youngest first, to our first morning in Montreal. After a relaxed breakfast at the hotel, we took a taxi to Mont-Royal Park. Mount Royal Park (in French: Parc du Mont-Royal), is one of Montreal’s largest green spaces. It was designed by Frederick Law Olmsted who also co-designed New York’s Central Park. The park resides on the Mont-Royal hill after which the city is named. We started our walk at Beaver Lake, an artificial lake beautifully designed and nestled in-between the woods. A waterfall garden adjacent to the lake is perfect for portrait photography. We continued up the mountain on the Chemin Olmsted trail, past the Sculpture Garden, the Smith House Museum and to the Chalet du Mont Royal. The chalet built in 1906 overlooks Montreal and offers an aerial view that is unrivaled. A semi-circular plaza in front of the chalet is the ideal spot to strike up conversations with the residents of Montreal as they go for their morning runs and dog walks while the kids run and dance around. A 2 mile loop will take you to the Mont-Royal Cross and back. The Cross was placed there in 1643 by Paul Chomedey de Maisonneuve, the founder of the city, in fulfillment of a vow he made to the Virgin Mary when praying to her to stop a disastrous flood. Today, the mountain is crowned by a 31.4 m (103 ft)-high illuminated cross, installed in 1924 by the Société Saint-Jean-Baptiste and now owned by the city. The rule in Montreal is that no building can be taller than the peak of Mount Royal and thus the Cross can be seen all the way from the St. Lawrence River. After a few miles of walking, the sandwiches at the Smith House cafe were just what we needed to refuel us. We headed back to the hotel and as our parents and kids rested, we decided to explore the Old Town. Maybe its the french, but as soon as you infuse it in, everything becomes romantic. Around the corner from the Embassy Suites is the Place D’Armes square and the Notre Dame Basilica presides over the square and all those that pass by it. With imposing Gothic Revival architecture, the church is a symbol of strength from the outside and a symbol of colorful diversity and inclusion on the inside. Unusual for a church, thestained glass windows along the walls of the sanctuary do not depict biblical scenes, but rather scenes from the religious history of Montreal. It also has a Casavant Frères pipe organ, dated 1891, which comprises four keyboards, 92 stops using electropneumatic action and an adjustable combination system, 7000 individual pipes and a pedal board. All that just means that you have to go inside and see it all. At the center of the square, is a monument in memory of Paul Chomedey de Maisonneuve, founder of Montreal. 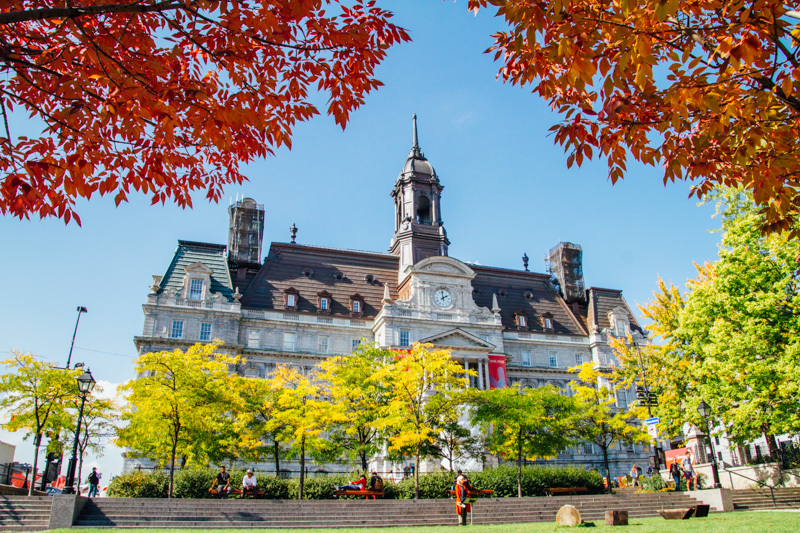 We walked east on Rue Notre Dame to Place Jacques Cartier, another lively square with markets, street musicians and the entrance to the Old Port of Montreal. In 1809, Montreal’s oldest public monument, Nelson’s Column, was raised there. Across the road from the square is the Montreal City Hall, Hôtel de Ville de Montréal, the seat of the local government of Montreal. It is a National Historic Site of Canada. On the front lawns are flower designs with seasonal themes. Adjacent to the square is Chateau Ramezay. Built in 1705 as the residence of then-governor of Montreal, Claude de Ramezay, the Château was the first building proclaimed as a historical monument in Quebec and is the province’s oldest private history museum. It was also designated a National Historic Site in Canada in 1949. Today it is a museum with a cozy garden and provides a peek into Montreal’s aristocratic past. Be sure to ask for the activity card for kids and that will keep them entertained in the garden. We switched to Rue Saint Paul and started with Bonsecours Market, a two-story domed public market. For more than 100 years, it was the main public market in the Montreal area. Inside, boutique shops, tourist traps, and cafes invite. Icelandic socks and knitwear, and maple syrup were popular souvenir choices. Rue Saint Paul is a cobbled stone road in Old Montreal and is filled with quaint shops, houses with beautiful front doors and porches and is perfect for an afternoon stroll. Halfway down, as we were exploring side alleys, and poking in and out of cafes, we heard Bhangra music, and saw a movie production crew blocking roads. We joined the crowd and managed to catch the shooting of a Punjabi song. It was hardly a 30 second clip but took over 30 minutes to get the final take. Having seen, tasted and experienced a flavor of all things Montreal, we returned to the hotel. We ended the day meeting friends for dinner and drinks at Atti, a Korean restaurant. The food was delicious, as we discovered all across Canada. In Toronto and in Montreal, irrespective of the restaurant, the price range or location, we found the quality of food to be consistently good. Day 2: The day where we pack it all in. Bright and early we headed to the Montreal Biodome. Overseen by the Montreal Nature Museum, it is a replication of four ecosystems from the Americas. The Tropical Forest is a replica of the South American rainforest. The Laurentian Forest is a replica of the North American wilderness. The Saint Lawrence Marine Eco-system is an estuary habitat. The fourth is a Polar area. All the exhibits are housed inside the former velodrome that was used for the cycling and judo events of the 1976 Summer Olympics with each of the four environments taking up a portion of the stadium. Over an hour’s walk through the biodome, you can see macaws, fish, frogs, cayman, lynx, beaers, ducks, starfish and penguins. Just another place to marvel at nature. Montreal was the host city for the 1976 Summer Olympic Games, and Olympic Park, is open to the public today. We took the funicular to the top of the Olympic Tower and were able to see the entire park, along with views of the Montreal skyline and the St. Lawrence River. We pretended to be track stars for a while and then came down to reality by taking a taxi to the Old Port of Montreal for our cruise on the St. Lawrence River. Saint Lawrence River is one of the most important rivers in the world, classified as a biosphere world reserve by the UNESCO in 2000. The river’s importance stems from the fact that it connects the Great Lakes to the Atlantic Ocean. The Saint Lawrence Seaway handles 40 to 50 million annual tons of cargo annually. We took a 90 minute cruise on the river, learning about the importance of the trade route, the history of Montreal and enjoying the views of Quebec. Across the Old Port is Habitat 67, widely considered an architectural landmark and one of the most recognizable and significant buildings in both Montreal and Canada. It is an apartment complex that resembles lego blocks stacked on top of each other, such that every apartment gets a private terrace and no apartment looks into a neighbor. We ended the day at the Montreal Botanical Gardens, where an extensive greenhouse houses plants and ecosystems from around the world, and the Chinese and Japanese Gardens are particularly spectacular. In the Japanese Garden, after taking a relaxing breath at the Zen Garden we rested further by eating Japanese snacks and drinking tea under the setting sun. The Chinese Garden comes alive at dusk, with the Magic of Lanterns exhibition, where an elaborate Chinese palace, and life and nature in China are depicted through lights. It was crowded the day we went, but time well spent as we strolled through the attractions. Day 3 was slower paced. We took our time with breakfast, and then spent our time walking around Old Montreal, a historic district and the original site of Montreal. Montreal has passed from Native American to French to British and the influences of each could be seen in this district. Buildings often date back centuries. Montreal is quieter, quainter and less quick than Toronto, and is a charming city that with requires a future, longer trip to soak it all in. Thank you! Please see the entire gallery at http://www.beautifulworld.photography/Worldgalleries/Canada. Can you please share with your friends.